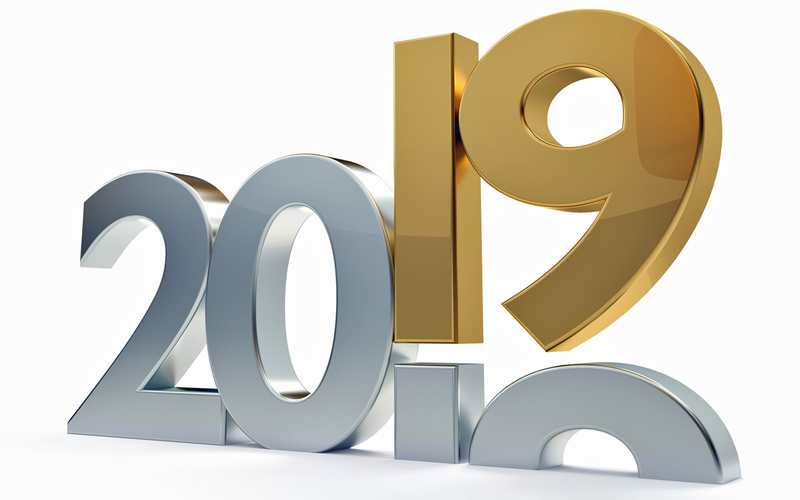 Wishing everyone at Quest a very happy, healthy and productive 2019! I hope you all had a fabulous Christmas and you are looking forward to the challenges and successes that this new year will bring. I would also like to extend a very warm welcome to our new Business Apprentice and Graduate Training students who began their Quest journeys this month. I have met each and every one of you and can see that you are already settling in well and quickly becoming part of the Quest family. We have many exciting events planned for this year, so do watch this monthly space to find out what students, present and past, and Quest staff have been doing. Have you seen our latest coverage? 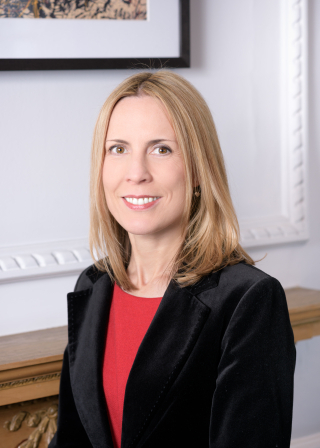 Preparing students to compete in a competitive job market place can be a tricky task, read as Claire gives her opinion on soft skills in School House Magazine. She also believes that having a distraction list is key to enhancing productivity at work, find out how in Anderson Hoare's blog! 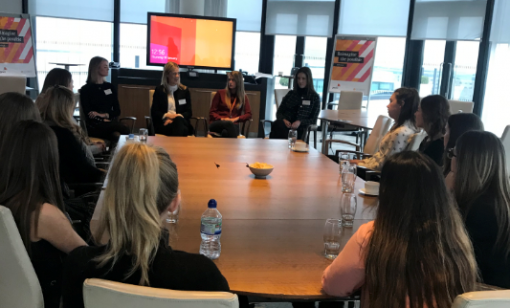 This month the Executive PA programme students were taken to PWC to have a look around their offices and to hear talks from members of the Quest Alumni who now work there! We hope you found it to be insightful and that it opened your eyes to the diverse range of career paths out there. The site visits are intended to highlight the diverse range of industry sectors out there so all students should take advantage of these opportunities. 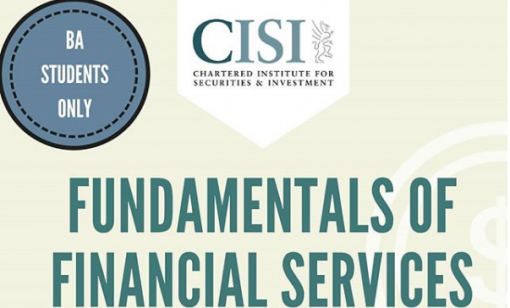 For the first time ever our BA students have been given the opportunity to take the CISI Fundamentals of Financial Services training programme. This is an optional course taught by Quest trainer Mark Dunne. Students will learn about the types of banking and commonly used financial products, such as shares, bonds and insurance and gain an understanding of financial terminology. We wish all the students registered the best of luck in completing the course! There is no denying that politics has been a hot topic recently! 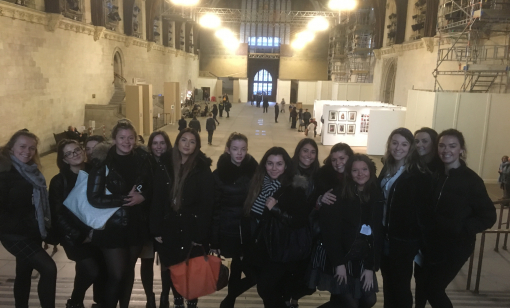 The Executive PA students know this first hand as they got to witness the excitement when they visited the Houses of Parliament. They sat in on debates in the House of Commons with Prime Minister Theresa May in attendance. 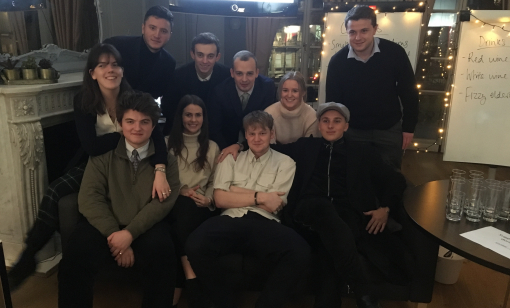 As part of their events module the Business Apprentice students host a fundraising event in aid of our charity partner, Action for A-T. Their event was held on the 17th January and they managed to raise around £2,000. 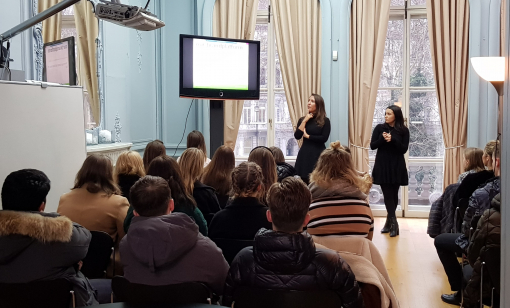 A huge thank you to Georgia Zambakides (an alumni student who was on the PD programme in 2013/14) and her colleague, Ella Beese for coming in to speak to our students. The Professional Diploma students got to learn all about recruitment services within property and also learnt about a company that really values its employees! It is not only our students who learn here at Quest! 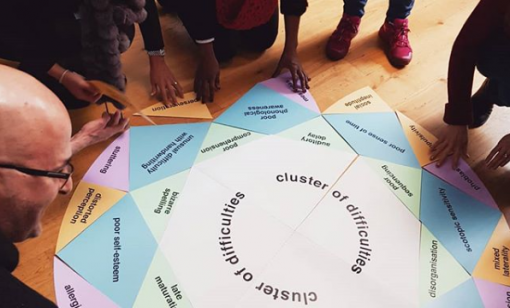 This month our trainers brushed up on their "neurodiversity" knowledge during a workshop which included a host of brainstorming techniques that can be adapted for the classroom. Thank you Janet for coming in to deliver such an interesting session. Our dedicated careers team works hard with present and past students to help them secure new employment opportunities in a range of industry sectors. This month we would like to congratulate the following students for securing new positions: Annabel Rule, Abigail Waterfall, Mimmie Kargotis Read, Imogen Kisberg, Georgia Wildman, Pippa Worlledge and Charlotte Pearson. We are very proud of all of you! For any of you still needing help, remember Emma and Alice are always here to support you, even years after leaving Quest. 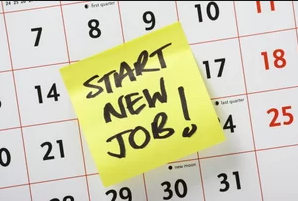 So, whether you are looking to secure a new role, wanting to gain work experience, make a move from your current role or simply to say hello, please get in touch with Emma Colville. We love attending career fairs and giving presentations to eager students looking to plan their future! This month we are grateful to Forest School, Badminton School and Epping Forest Consortium for having us. If you are interested in Quest Professional visiting your school or careers fair, or want to find out the services we can offer then please get in touch. Do you know someone who may be interested in studying on one of our programmes? 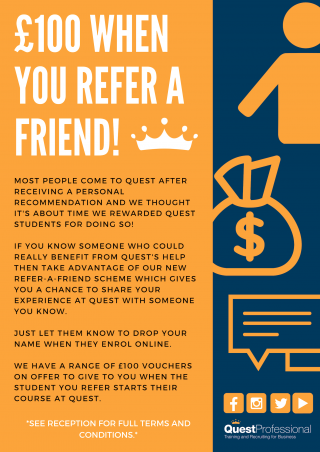 Why not take advantage of our refer a friend scheme and earn yourself a £100 voucher when they successfully enrol with us. Terms and conditions apply so please contact us to receive further details. Are you looking to study with us? If you are interested in enrolling on one of the courses then get in touch with us on 020 7233 5957 or email us to arrange an appointment to visit and reserve a place on one of our programmes. Please feel free to share this newsletter with anyone that it may be of interest to and ask them to get in touch with us should they wish to be added to the mailing list.